So many worked so hard to find resolutions to the multiple issues at Restlawn last winter and spring. As we came against one brick wall after another, it became evident that South Dakota cemetery law had inadequate provisions to address our concerns. We are writing to request that you sponsor legislation in the upcoming 2019 session that will serve to close the serious gaps in South Dakota cemetery law. As you might recall from our previous communication, we represent the Restlawn Alliance of South Dakota, a group of people who have had ongoing concerns about Restlawn Memory Gardens. Most of the members of the Restlawn Alliance are your constituents in Beadle County. Others are the constituents of other SD legislators, and a few of us are now living out of state. All of us, however, have dealt with Restlawn, Inc.’s failure to deliver pre-paid markers, failure to repair markers damaged by cemetery staff, the poor upkeep of the cemetery buildings and grounds, the poor communication from its out-of-state owner, and/or the lack of transparency about the status of the perpetual care trust fund. Through public pressure, much of which came from the Restlawn Alliance, some of these issues have been minimally addressed in recent months. However, the status of the trust fund in particular remains an area of great concern to us; there is no mechanism that provides information about the health of the trust fund to those who have purchased pre-paid contracts or to their descendants. As an example of the impact of this concern, the two of us have chosen not to inter our parents’ cremains at Restlawn at this time, even though they purchased and pre-paid for plots and markers decades ago. We have not felt that we can yet follow through on our parents’ wishes to be buried there since we have no idea of status of the trust fund and whether there are sufficient funds to maintain the cemetery over time. We also have a number other close family members interred at Restlawn, and the upkeep of their graves is very important to us as well. Dozens of other people have contacted us with similar concerns, and, as you probably know, some families have chosen to move their relatives’ remains to other cemeteries and mausoleums due to the deterioration of the buildings and grounds at Restlawn. Our hope is that you and your colleagues in the state legislature will act in the upcoming session to address these issues and to bring South Dakota’s cemetery laws closer to the protections provided by the laws in other states. Accountability Currently, there is noofficial body or person in South Dakota that provides oversight of cemeteries. We suggest that the current Board of Funeral Service add a division of Cemetery Oversight that would include the ability to inspect cemetery grounds and records, especially those pertaining to trust funds. Transparency We strongly encourage that each perpetual care cemetery be required to submit a complete and thorough annual report of the status of its trust fund and that such reports be made available to the public upon request regardless of the size of the cemetery. Trust Management We advocate SD statute 55-12-18 be amended so that “funds to be administered by trustee under control of licensed banking institution” include cemeteries with less than three thousandpeople buried. We also strongly recommend a provision be included stating that no cemetery operator, director, officer or shareholder may borrow or in any other way make use of the perpetual care trust funds for his/her own use. Requirement to provide care We advocate a provision that perpetual care cemeteries be required to provide upkeep of the cemetery’s buildings and grounds. Violations We recommend that penalties for willful violations of cemetery law be strengthened to include higher financial penalties and even incarceration in egregious cases. We are grateful for your attention to this request and would be very happy to speak with you in more detail about this important matter. We could also help you get in touch with your constituents in Beadle County who would be able to talk with you in person about this request. We understand that you know that, while those buried in Restlawn are themselves past worry, the conditions this cemetery greatly trouble those of us with loved ones there. Every system is perfectly designed to yield the results obtained. Many of us who are members of the “Restlawn family” have tried dealing with the system that has led to the current conditions at the cemetery. We’ve contacted the owner—or made attempts to do so, anyway. We’ve pleaded with the cemetery staff and made calls to the mayor of Huron. Some folks have gone to Restlawn themselves to mow and do general clean up. We’ve posted message after message—with photographic evidence—on social media. Letters and emails have gone to the Beadle County Commissioners, and we’ve written letters to the editors of local newspapers. Our most serious efforts have been invested in detailing complaints to the Attorney General’s office. But, while some long-delayed markers finally arrived and at least some mowing is getting done, it seems like no real investment is being made to upgrade the sorry conditions at Restlawn. The more we’ve studied this situation, the more we understand that the legal system in South Dakota has contributed to this outcome. The state cemetery laws are simply puny, and if we don’t like the results obtained from them, then we need to keep working on changing that system. Ok, we’re finally getting to our second suggestion. We gather that Kristi Noem has promised not to establish any new state boards for any issue if she is elected, with the belief that the various systems currently in place can do the job for South Dakota. Rather than trying to convince this frontrunner for the governor’s office to set up a new board, let’s contact her to ask that an existingboard—the South Dakota Board of Funeral Service—be expanded to have jurisdiction over cemeteries, too. Right now, the funeral board has norole in cemetery issues, as they have told us themselves (https://www.restlawnalliance.com/information/2018/5/14/the-not-very-long-arm-of-the-law). But there is no reason that they couldn’t have this kind of authority, too, like they do in many states. The best boards, we understand, are made up of family members as well as people who are in the cemetery and funeral business. And if you have the chance to talk with her in person, maybe at a campaign stop, that would be even more awesome. Please don’t be shy about pushing for this change even if you aren’t currently living in South Dakota. Our loved ones in Restlawn deserve our voices no matter where we might be located, right? It hasn’t happened yet, not even a little bit, but as we campaign for reasonable cemetery laws, we can anticipate that someone somewhere will claim that better written laws will put a damper on South Dakota business. So let’s have a few counterarguments in our back pocket in case something like this ever pops up online or in person. Here’s one: We have evidence right in front of us that feeble cemetery laws don’t do South Dakota businesses much good at all. 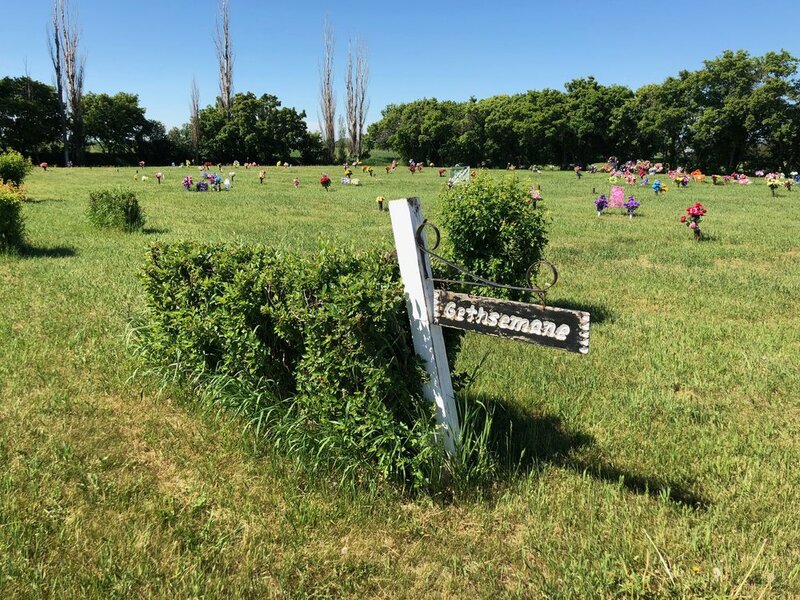 There are all kinds of local companies in Huron and Beadle County that do business with cemeteries, those that provide vehicle parts and repairs, for instance, and those that sell building materials, lawn care equipment, office supplies, and more. If cemeteries like Restlawn aren’t being held to their contractual obligations about upkeep, then they aren’t contributing to the local economy much. Even worse, they can leave unpaid bills around town, meaning that small businesses have had to shell out for goods and services without being paid. We don’t know the current status of Restlawn’s accounts in the area, but when we first launched the Restlawn Alliance, we heard both directly and indirectly from local firms who were hoping that we could help them collect on past due bills. Here’s a related idea: If the feet of a cemetery corporation arebeing held to the fire in terms of their contracts, then that business is employing more people or at least is employing their current staff for more hours. So those folks are bringing home more in their paychecks, which, to a large extent, they are probably spending at other area businesses. That old saying about how a rising tide floats all boats applies here. Finally, if we are really concerned about South Dakota businesses—and we are—let’s keep in mind that owners of cemetery corporations may not be located in the state where the cemetery itself is situated. The assets that local residents have paid into these corporations through pre-need contracts then can just drain out of the state. It is South Dakota’s interest to make sure that these out-of-state owners—and those in state, for that matter—are required to do right. All told, sensible cemetery laws protect families, but they also bolster the local economy, making them a win all the way around. And besides, such laws will help us honor our loved ones, our ultimate goal. P.S. Our next specific suggestion about putting some muscle into South Dakota cemetery laws is coming later this week. In the meantime, if you haven’t yet asked South Dakota legislators to tighten up the existing financial reporting law, please check out how to make this request in the post right before this one, “Being Our Own Heroes.” We promise that contacting those legislators about this will take you five minutes, tops. For years now, Restlawn families have been hoping that someone will ride up on a white horse to save the day. This knight in shining armor would see the condition of Restlawn, reach into some (very deep) pockets to buy up the place and set things right. Yes, well, as a strategy, this isn’t panning out, is it? Even if some of us might still be waiting for that knight to ride into Beadle County, there’s nothing saying that we can’t stand up for our loved ones ourselves at the same time. And it looks more and more like being a Restlawn hero is tied to changing the cemetery laws in South Dakota. Legal stuff can be daunting, we know. And probably none of us had any intention of becoming an expert in South Dakota cemetery statutes. But we don’t have to begin with anything complicated. Let’s start by asking in a nice, but firm way, that a relevant law already on the booksbe enforced. Here’s the law, as stated on the Codified Laws section of the South Dakota State Legislature site. 55-12-17. Annual financial report. A perpetual cemetery, as defined in § 55-12-4, or a perpetual cemetery corporation operating under chapter 47-29 shall file an annual financial report for the preceding fiscal year with the secretary of state by July thirty-first of each year on a form prescribed by the secretary of state if the cemetery has one hundred or more people buried in the cemetery. Source: SL 2013, ch 232, § 2; SL 2014, ch 228, § 5, eff. Mar. 28, 2014. This law is pretty simple really. It just means that cemeteries like Restlawn need to file a one-page South Dakota Perpetual Care Cemetery Annual Financial Report with the Secretary of State. That “Delinquent” designation appears to indicate that there was no report filed for Restlawn for 2017. We don’t know why one wasn’t submitted as required by law, but, as the Argus Leader reported back in 2014, there appear to be no built-in enforcement for this law at all. And so, because it is toothless, very few cemeteries follow it, and, as a result, no one is watching the store. So here is a case where we don’t need a whole new law. We just need to ask that the existing law be amended so it can be enforced. It would have the most impact if those of you who still live and vote in South Dakota would take action about this, but really, anyone can make an appeal to these legislators. I am writing to request that you and your colleagues sponsor legislation to provide enforcement for SL 55-12-17, the statute requiring perpetual care cemeteries to file the South Dakota Perpetual Care Cemetery Annual Financial Report. Since there seem to be no means to enforce this law, few South Dakota cemeteries adhere to this requirement. One of those cemeteries with a delinquent status is Restlawn Memory Gardens in Beadle County. This cemetery, as you may know from the news, is in shameful condition.One step toward making sure that the company is held accountable—and that no other South Dakota cemeteries are allowed to neglect their financial obligations—would be to tighten up the requirements for this annual report. I hope you will agree that South Dakota families deserve the same legal protections that honor loved ones as do people in other states. This issue means a great deal to Restlawn families; I am grateful for your help. The wording of this template is quite formal. If you know any of these legislators personally, you could take a more casual approach, of course. But don’t worry about getting the perfect wording. Just make your opinion known! People have contacted us from all corners of South Dakota (and beyond). If everyone who reads this website or the Restlawn Alliance Facebook page would send an email or place a phone call, this would matter. Once again, we are thinking of the very elderly folks who have contacted us, worried about the conditions at Restlawn and concerned that their wishes will not be honored. Who will speak up for them—and for those who are already laid to rest there? I think that would be all of us. As you have already guessed, this isn’t a picture of Restlawn. This is Graceland Cemetery in Mitchell in a photo we took last week. This place is just as lovely and pristine as we remembered it from prior visits. Every single gravesite that we saw looked tended, and the whole landscape showed the respect that the city of Mitchell is able to demonstrate for their loved ones. We felt good knowing that our family members who are buried there are resting in a place that honors them. Many of you will recognize Riverside Cemetery in the photo above. As we walked around a week ago, we spotted a few places that needed a little bit of attention, mostly an occasional spring weed that had gotten the jump on the groundskeepers. Overall, though, Riverside displays the care and attention that has been paid to this place across the years. Like many of you, we have quite a few of our deceased family members across multiple generations there, and we are grateful for the dignity that they have been shown. Yes, this is a recent photo from Restlawn. We wish we could say that this was the only gravesite that was covered with weeds instead of grass, but, sadly, that wasn’t the case at all. The exterior of the mausoleum is quite literally falling apart in spots. The exteriors of the other buildings are depressing, too. Years back, this used to be a flower bed. The other spots that used to be landscaped match this one. As mentioned in the post from a few days ago, we had driven to Restlawn anticipating signs of hope. We did find a few upbeat notes; the woman now working part time in the office really seems to care, and the inside of the mausoleum looked quite a bit better than the photos that had been posted by others in recent months. Quite honestly, you don’t know whether to laugh or cry when looking at those things, right? As we drove away from Restlawn, we thought about the memorial service we had just concluded for three of our family members. The gathering of family for this memorial was very special to us, but, after visiting Restlawn, we knew that we couldn’t inter the cremains of any of them there as yet. We thought, too, about our family members and neighbors who are already buried there, and about how much we wish that their final resting place was as respectful as Graceland or Riverside Cemeteries. As we headed down the highway toward the Sioux Falls airport for our flights home, we talked over the specific steps that need to happen if things are ever to be set right at Restlawn. Our very next post will be all about those steps, so please stay tuned. In the meantime, if any of you could convince those in charge at Restlawn to haul those deer to the Huron Landfill, you would totally make our day. They can bring along the siblings of those deer, too. All the flowers from Memorial Day were still there, and they brightened the look of the whole place. We were greeted by a new employee in the office who was friendly and helpful. She was able to answer some of our questions and was hard at work on straightening out the records, an important step. Also, the interior of the mausoleum was clean, and the foul odor that we’d heard about before was gone. Most of the graves had markers, which has to be a comfort to many families. The grass had been mowed, and maintenance workers were on site – another plus. It was treacherous to walk across the grounds since there were so many graves in which the soil had settled. And there were many that had gone to weeds, with little or no grass. It’s important to note that quite a few of these graves were not new. They clearly had not been properly tended across more than one season. We could see some grass seed here and there, but the soil was very dry and looked as if it hadn’t been watered in some time. The exterior of the mausoleum had many bird droppings and what looked like water damage—or something. Any ideas about what caused those half circles on the walkway ceiling? There were lots of them. Signs around the grounds were in need of repair, and those dead trees around the perimeter were just depressing. The utility building and the office were in a sad contest for being in the worst repair. The roof of the office building is clearly in need of replacement. Even worse was the odor inside the building. We couldn’t identify if it was mold, dead animals, water damage, or something else. Whatever it was, it was terrible. I can’t imagine what a person would think if they were looking for a cemetery to bury a loved one or to purchase plots for themselves in the future. I know I would have left immediately and never returned. And our visit did not, of course, inform us of the status of the trust fund. We have chosen to wait to inter the cremains of our parents until we know the results of the investigation of the Attorney General’s office. There is still a great deal of work to be done and questions that need answers before we can make that final decision. In the meantime, it was hard to drive away from Restlawn. Even if we make another choice for our parents, a number of our other family members are buried there in a place that still doesn’t reflect the respect they are owed. We know that so many other Restlawn families feel the same. Our family is made up mostly of educators, with a few engineers, musicians, and business people thrown in for variety. Since there aren’t any lawyers in our current family tree, it’s taken us a while to trudge through South Dakota cemetery laws and regulations to see what kind of protection or recourse they offer families. Because we aren’t attorneys, we’ve done our best to consult with those who do have legal expertise, in particular with Richard Lang, who has been reviewing laws applicable to Restlawn. We have also checked in multiple times with the SD Attorney General’s office and with other SD government offices. But since the writing below is ours, please remember that we’ve never taken LAW 101, let alone passed a bar exam. Also a family’s individual circumstances will have an impact on how some of these laws and regulations apply. As they say, your mileage may vary. With these caveats in mind, here are the questions that have made our FAQ list. Q. What state organization is responsible for cemetery oversight in South Dakota? What authority does this group have when regulations are not followed? Q. Do other states have boards or offices that are responsible for cemetery oversight? or the one in Illinois. Other examples available upon request. Q. Are owners of South Dakota cemeteries required to submit annual financial reports to the Secretary of State? A. Yes, in fact they are. They are required to file the South Dakota Perpetual Care Cemetery Annual Financial Report. Q. What happens if owners do not submit the South Dakota Perpetual Care Cemetery Annual Financial Report to the Secretary of State? A. Apparently nothing. Not even a fine. So it isn’t surprising that SD cemetery owners seem to ignore this state requirement. The Argus Leader reported on this lack of enforcement a few years back. Q. What authority does a county or a municipality have in regard to a cemetery operated by a corporation? What recourse does a county or municipality have if a cemetery owner is out of compliance? Q. So if there is no SD cemetery oversight board and if counties and municipalities don’t have authority over a corporately-owned cemetery, who is responsible for dealing with complaints? A. Many of us with concerns about Restlawn have been referred to the Consumer Protection department within the Office of the Attorney General. This department looks after a very full range of consumer issues. Q. With this breadth of concerns to deal with for the entire state, how many attorneys are on the staff of the Consumer Protection department? A. One, according to a Consumer Protection supervisor. Q. Can people who have paid for pre-need burial services find out if it is likely that their contract will be honored? A. This doesn’t appear to be possible. Q. How can someone learn about the current assets held in an endowed cemetery trust in SD? A. It seems this can be achieved only though a subpoena in the event of a lawsuit. Q. Can people in other states learn about the assets held in an endowed cemetery trust without a lawsuit? A. They can at least in Ohio: “Annual reports of all the assets and investments of the endowment care trust shall be prepared and maintained, and shall be available for inspection at reasonable times by any owner of interment rights in the cemetery.” See the entire Ohio law about endowment trusts here. We’re currently examining other states’ laws in this regard. Q. What recourse do family members have if they had to once again purchase a vault that had already been paid for through a pre-need contract? A. They could sue for breach of contract. Q. What level of failure to comply with a pre-need contract (like for markers or vaults) constitutes a breach of contract that would be taken seriously? And how far would the upkeep of a cemetery need to decline in order for these issues to be regarded as a breach of contract? A. This would depend on the facts at hand. But if funds are missing, that could constitute a serious breach of contract. Q. Is a pre-need SD contract that specifies various goods and services still binding when ownership is transferred to someone else through a traditional sale? A. Yes. But this isn’t always achieved without a struggle. See this Tennessee case as an example. Q. Where can I find the South Dakota laws about cemetery perpetual care funds? Q. How can I read other SD cemetery laws? A. It’s easy to find these laws. Try this page, and enter “cemetery” in the text search box. Q. Are all of the relevant laws specifically about cemeteries? A. Not necessarily. Some are about corporations. Q. If I’m not happy with a SD law, what can I do? Q. Who are my SD state representatives? A. You can locate them via this page. You also can send a message to restlawnalliance@gmail.com. What is the status of the trust fund? The arrival of long-awaited markers along with maintenance to the grounds and mausoleum at Restlawn is certainly welcome news. These are things that many have been months, and in some cases years, fighting for. While many of us rejoice with the news of progress, there is still a great deal of anxiety about the permanent endowed care fund. Just how much, if any, money is in that fund? At the present time, we have no way to find out. When we deposit money in a checking, savings, money market account or the stock market we receive regular financial reports. Yet we are never allowed to know the status of the fund at Restlawn in which we or our loved ones invested in, sometimes years ago. The comprehensive endowed care fund laws of Missouri require accountability and transparency. Evidence of this is in the link below to a webpage from a Missouri cemetery that provides annual financial reports regarding the endowed care fund to the public. It is my hope that South Dakota legislators address this issue during the next session. South Dakotans deserve similar transparency and accountability. Maybe the biggest takeaway from the Restlawn situation is that we can all see that the whole community cares about the cemetery. The community is mostly made up of people in Huron and the rest of Beadle County, of course, but it also includes those who now live all across the U.S. and even in other countries. The emails, the posts on the Facebook groups, the TV and newspaper interviews, the phone calls—everything said about the state of Restlawn lets us know that the larger group is dedicated to turning things around. As many have said, though, seeing this through will be complicated. When you pull on one thread—say, the upkeep issues, the missing or damaged markers, or the condition of the mausoleum—many other threads come along, too. They include the state of the endowed trust to pay for things going forward, the interpretation of South Dakota cemetery laws, the enforcement of those laws, and so much more. These issues are pretty overwhelming. Just to be done with all of this, a person can feel like declaring a complete victory for the entire situation as soon as anything positive comes along. It is important to stay optimistic. If we don’t believe that Restlawn can be restored, then what’s the point, right? But it’s also important not to quit too soon—and for the community to care about everyone who has been affected, even if our own personal complaint is eventually addressed to some extent. All of us with Huron and Beadle County roots will recognize one person after the other. These were our neighbors who lived down the street, the schoolteachers who put up with our antics and taught us anyway, the doctors and nurses who invested so much dedication and heart to make sure our community was healthy, and many of our former town leaders. This list also includes the names of those who were gone far too soon; you look at some of those dates, and your heart just breaks. In recent weeks, many people have made a special point to say that they are going to hang in there until the whole cemetery is returned to its former state, even if their own family’s marker is delivered or some other issue looks a little better. This has to be the right way. Even though I live out of state, I have been following the news of the blizzard that is bearing down on South Dakota. I hope that everyone is sheltered from this monster spring storm. If you find yourself with a bit of extra time that you weren't expecting, perhaps you could take some time to log onto the Find a Grave website and read through some of the names and obituaries of those interred at Restlawn. I recently read through this list and was surprised to find the names of a couple of relatives that I did not realize were buried at Restlawn. I also saw the names of several of my old neighbors as well as parents of many of my HHS classmates. So many fond memories came back and I felt it was an honor to reacquaint myself with the lives of many people I knew during my years growing up in Huron. I finally saw Coco, the Pixar movie released last fall by Walt Disney Pictures. It had not only the charm I expected from a Pixar/Disney movie, but also several scenes of families lovingly tending the graves of their loved ones at a local cemetery. There was a deeper message, too: loved ones that have passed away are still part of lives and their importance is not diminished by their passing. I believe our group has that same desire to cherish our beloved family members who have passed away. By tending their final resting places, we continue to honor their influence, legacy and love in our lives. o Reaching the owner has been very difficult. o Reaching the office staff has been considerably difficult. o Local officials are referring all Restlawn issues to the attorney general’s office. o Pre-paid monuments have not been delivered. o In some cases, the person who entered a complaint about the non-delivery of a marker on behalf of a loved one has since died. Now both family members are in unmarked graves, leaving others in the family to continue the complaint. o Pre-paid vaults have not been available, requiring repurchase. o Elements of markers, like scrolls and dates, have not been delivered. o Coldspring monument company has confirmed to individual families that no payment for ordered markers was sent by owner. o Getting markers installed by another route appears to be difficult and/or expensive. o Markers damaged by workers have not been replaced or repaired. o Elements of markers that have been stolen have not been replaced. o Markers that are sinking have not been repositioned. o Families have had difficulty accessing the mausoleum to place flowers. o The mausoleum is dirty and looks and smells bad. o Retrieving cremains to relocate to another mausoleum is difficult. o The ground above recent burials has sunken. o Wreaths have been left to brown since Christmas. o Other wreaths or decorations have been piled up like trash and left on top of graves. o Grass was not planted over recent graves last summer. o Grass has often been left to grow very high. o Bushes have not been trimmed. o Painting needs to be done. o Gopher holes are prevalent and have not been filled in. o Those who have made pre-need arrangements are concerned about whether their contracts will be honored. o The awareness that Restlawn has unpaid bills at various Huron and SD businesses (beyond markers and vaults) has led to the worry that maintenance problems will become worse.